Grey & white slogan badge. 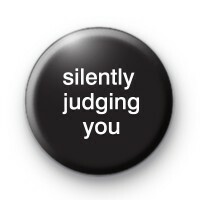 This sassy 1-inch badge has the text Silently Judging You written in a simple font. It lets everyone know that you're giving them side eye & sizing them up. It is a funny slogan badge and makes people wonder if you're judging them but they will never know!